“Educators – light of the world” was the theme of an Adventist Education Summit bringing together 497 teachers, district pastors, and education leaders from the seven fields and conferences comprising the Indian Ocean Union Conference (IOUC). 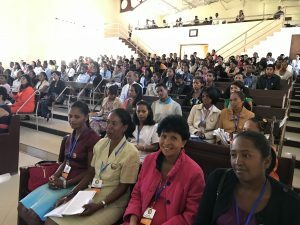 Held in Antananarivo, March 22 to 26, 2018, this five-day training provided teachers from the 73 union schools and one university across the island nations east of Africa – Madagascar, Mauritius, Reunion, Seychelles, and Comoros – with opportunities to network and grow together. Coordinated by the Union Education Director, Ps Raoeliarijao, the program included presentations by Dr Hudson Kibuuka, General Conference Associate Education Director; Dr Coster Munyengwe, Southern Africa Indian Ocean Division Associate Education Director, Dr Larry Burton, Andrews University Professor of Teaching, Learning & Curriculum; and Dr Glynis Bradfield, Andrews University Associate Professor of Curriculum and Distance Student Services. Topics included redemptive discipline, ways to manage multi-grade or single-grade classes using differentiation, ways to integrate faith in teaching and the management of school culture. Each session provided new insights, introduced new resources, and challenged teachers to try new approaches to teaching and learning in their context. Through the workshops, Adventist teachers realized that their work is not only to transmit knowledge, but to develop thinking and problem-solving skills so students are able to make the right decision for this life and the life to come. Students will thus be prepared to be good citizens on earth and in heaven. Teachers were encouraged to be curious, to keep learning in their field and in ways to effectively teach. Malagasy education leaders participated in the opening and closing ceremonies. The Prime Minister’s Cabinet Director, Constant Rakototafika, made the opening speech, with a further message by the Private Schools Director, Fara Hanitra Randrianantoandro. Each speech emphasized the role of education to develop a country, and pledged support of the Adventist educational system and its teachers in Madagascar. The Minister of Education, Mr. Paul Rabary, honored the Summit by presenting the closing speech himself. Humbly and transparently, he shared challenges in education in Madagascar, including literacy in primary years, and changes underway in the school calendar and the CEPE (primary school examination). He invited questions and honestly answered all, sharing his phone number, inviting teachers to keep him informed of the state of education wherever they were serving. On Sunday evening, cultural activities provided an opportunity for everyone to have fun together while learning more about each region’s cultural heritage. The services on Sabbath rekindled faith and purpose. Teachers felt blessed, inspired and revived, ready to accomplish their calling as teachers to be a real light of the world. Learning of the General Conference’s strategic plans for education, participants met in groups to share activities that were working well, challenges and proposed solutions to reach the goals of Adventist education in every school. Through group presentations and personal testimonies, data was collected by the Union on current needs to improve the quality of holistic, Christian education. These recommendations will be discussed in the IOUC education committee and we hope will shape actions in the near future. The last wish of each teacher is that the IOUC will organize continuing education like this every year.